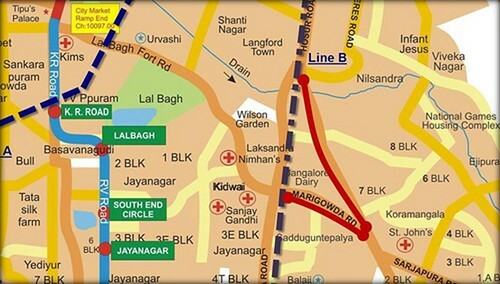 the tunnels are planned along Venkatswamy Naidu road – Queen’s road route). on the high side within the heart of the CBD. Metro due to substantial enlargement of the catchment areas within walkable distances. average station spacing in the first phase (1.033km – 40 stations for track length of 41.3km). decongestion and limit private vehicle use within these CBD areas. pointed out by Abhilash & Prasad tech parks. road and Main Guard Cross road. road and Jasma Bhavan road. suburb of Whitefield, whilst ignoring the very real requisites in far more important CBD areas. (Jordan, Yau Ma Tei, Mong Kok, Prince Edward, Shek Kip Mei) – spaced 780m apart, on average. Subway routes 4, 5 & 6 between stations 23rd, 28th & 33rd streets – spaced about 420m apart. large distances away on both sides of the Metro route/s, necessitating shorter spacing. commuter inconveniences decade after decade is certainly not desirable. it appears that it might be a little too late to correct this. I request a meeting with you at the earliest – please advice a date & time of your convenience. Perhaps it might be better to locate the proposed cubbon road station squarely between the two intersections (i.e. between Main Guard cross rd & Lady Curzon rd) so as to service both. Also, since there are no activity points on the southern side of cubbon rd, main entry /exits can be arranged on the northern side with only emergency exits positioned on the southern side. There are stations in phI like the Vidhana Soudha and Minsk sq, which are just 350-400 mts apart..probably there is no specific trend in how the stations are planned..probably land to be acquired and as documented in the bible like DPR by 'foreigners' DMRCL guides everything.. I think the MG road station in PH II will be on Kamaraj road btw MG road and CUbbon road(nothing to acquire on brigade road then) and this will cater to Infantry road and Commercial st..
Also moving up the SHivajinagar station to have a exit closer to infantry road would help.. I think your suggestion on the queens road/cunningham road station is more appropriate and would help lot of people! 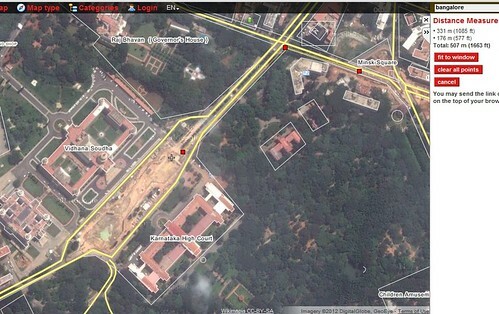 The straight line distance between Minsk sq & Vidhana soudha is 670m (from google maps). On road (along Cubbon rd & Dr Ambedkar rd), the distance is 785m. It isn't 350-400m either way. So, the stns are appropriately spaced in this part of CBD. The ph-2 u/g stn is on Kamraj rd adjacent MG rd & at a distance of 90m from existing elevated stn (& not inbetween Cubbon rd & MG rd). This is located such that interchange between the two stns (i.e. purple line & ph-2 line) is seamless. Also abt the MG road interchange you talk about. I agree the nearest end exit which will integrate with the reach 1 station will be 90 mts..however will it not extend on kamaraj road towards cubbon road for atleast 150 mts? 500m edge to edge - okay. So, it isn't 350-400m as claimed previously. The 500m is not necessarily the distance between stn entry /exits - in all likelihood, it might be 650-700m depending on where exits are positioned at the stns, which is fine since both these stns lie within CBDs with multiple activity centers around them. The u/g stn may extend 150m into Kamraj rd, but the walking distance to mid-point on commercial st will be over 850m. Also, from Shivajinagar stn, it would be 850m along shortest road /walk route, & from Minsk sq stn, it would be over 1.5km. Therefore, a closer stn is necessary & it might be best located between Main guard cross st & Lady curzon st - this would facilitate easier access to the many commercial establishments on both these rds (such as safina plaza), in addition to eastern parts of Infantry rd, Bowring hospital rd, Dispensary rd & Comml st. It isn't clear to me what your point is - as explained, the 1.0km spacing within CBDs is not necessarily correct. At some CBD locations, it will have to be closer to provide easy walking access to commuters. Upto a mximum of 400-500m is considered acceptable, but 850m is certainly not easy walking distance by any yardstick, especially for women, children & old people. In places like Newyork & Guangzhou, there are stns spaced 400-500m apart for this reason (see letters to BMRC above). just that BMRCL has no fixed pattern on spacing the stations..its all with what the DPR done by DMRCL drives at.. I am also really for increasing the reach as much as possible with shorter stops..but I am rather very sceptical that our talk will be taken with any seriousness by BMRCL..
Infact if you remember, I am for the gotigere line to divert at dairy circle to travel on marigowda road and get onto hosur road near forum mall..which would have connected Koramangala in PH II..this would have helped coverage really well..and I mailed BMRC many times..but no use! Maybe talking to state UD minister might help! Not to contest things, but as stated earlier (by me & others), DMRC is the best suited by virtue of their experience. No other organization in India has such experience, & they are also preparing DPRs for Jaipur, Chennai, Cochin, Chandigarh, Pune, etc because they have been recognized for such job scope. 1) To start with, the route is turning backwards, away from the direction of it's destination & this would add needlessly to trackage distance (over 2km - nearly 500-600 crores). 2) The turn from Marigowda rd to Hosur rd is about 150deg. To incorporate such a large turn in the design with the limited space available might not be possible since the area is fully builtup. If attempted, it might involve very large land acquisitions & demolitions as foundations would be deep with many high structures since minimum turning radius will need to be maintained. 3) Both Marigowda rd & Hosur rd are bus thoroughfares that have plenty of buses running on them. Thus, interchange options between modes is plentiful. Thus, I don't think such a deviation is a good idea at all & may be this is why BMRC had not responded. Arguably, you have the most experience of seeing/using metro in many countries..havent there been these kind of deviations elsewhere especially within the city? Coming from Jayadeva, the plan is to go UG at KMF junction..we have the govt ITI land on the left..on the opposite is nimhans land..on the far right corner is KMF land..all empty space as of today! Current bus stop on Marigowda road is 250mts from the junction , infront of CHrist College..so reaching that will be a pain anyways! havent there been these kind of deviations elsewhere especially within the city? No sir, I haven't seen metro tracks anywhere that back track & then turn around. we have the govt ITI land on the left..on the opposite is nimhans land..on the far right corner is KMF land..all empty space as of today! I was referring to the turn near Forum, not the one near Dairy circle. I'm sure bus stops will be shifted closer to metro stn/s for easy inter-change once metro trains are operational - & 250m is walkable. I'm not sure I see any deviations on the map that take the route backwards & then forward. Not sure if there are any at all anywhere in the world. If some were built with routes going backwards & then forwards, I would say that they are wasteful & ill planned - this is my personal opinion. Turn radius for Bangalore metro is 300m - this is the governing issue & not the existence of KEB or wide median rd - these do not automatically imply that the 150deg turn can be built & implemented without land acquisition within the space available. I think they will be positioned closest after Metro becomes operational & that should suffice as the distance is walkable. @Naveen, did you get any response from "Namma" metro regarding the letters? Does the company has official public interaction channel(like public hearings etc)? MD Sivasailam is currently out of station. BMRC has confirmed receipt of ltr/s & are looking at feasibility. They promised to revert after MD's return. I checked distances on the maps for the marigowda road - hosur road jn..there will be issues with turning as you said..the current space available is about 75mts only! So they will not be able to do anything without acquiring land..which will make the detour very expensive.. But still feel..all blr metro routes we have are designed on 'least resistance' or least acqusition proposition..than on real traffic needs or travel patterns..thats something we will have to live with! The need for the additional stations is more clear on the map below. As can be seen, with both stations in place (on two possible alternate track routings), the catchment potential is huge. The routes are of course speculative, but expect tunnels will be along either of these routes, depending on which is most economical /viable & based on ground realities. Metro Ph-2 being finalized ?